But those areas are just as important! The most unknown item to look for on a Carfax, but no less important, is a notation that a vehicle was, “Listed as a manufacturer vehicle, sold at auction”. For a more in depth look into exactly what that is, read the article attached to the link. But, essentially, these vehicles are usually cars that had such serious defects that the manufacturer had to buy them back from an owner. They are not always defected cars! They could also simply be a car that was used in displays at auto shows or large sponsored events. So, if you see this on your vehicle’s history, make it a point to ask the dealer why the manufacturer sold the car at a dealers auction. A car that another dealer couldn't sell. The car is at the auction because the current owner can’t/won’t sell it. If they could, and make a good profit, they likely wouldn’t be there (They are Dealers, Right?). That being said- That isn’t ever going to be enough for me to recommend that you don’t buy one of these vehicles (Far from it). But a vehicle sold at a dealer auction IS at the least a Yellow Flag to trigger an independent vehicle inspection. Whether you trust a car dealer or not, always verify what you are shown, and what you are told. Carfax Was Pulled Weeks Before! Always be sure to check the date of any Carfax you are presented and if you receive a Carfax that is several weeks old, request a new one! (Dates can be found under the main score card and inside of the “Buyback Guarantee” tab. Dealers know that consumers are weary of vehicles purchased at dealer auctions and that you would much rather buy a used car that they obtained directly from its original owner. So, what some dealers decide to do is pull the carfax reports of vehicles BEFORE they are actually sold at auction. This provides them with a vehicle history report that looks as if the previous owner must have just sold or traded in the car. 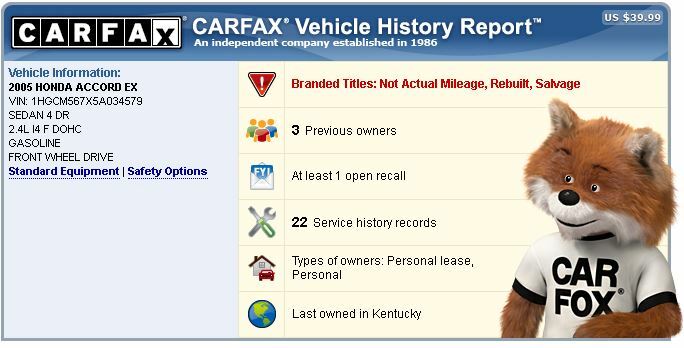 The first, and undoubtedly most important section of the Carfax Report is the Carfax Accident and Damage Report. Here you are going to either see that big green check mark or a yellow/red warning sign. The Yellow Warning Sign (Pictured Above) will indicate an accident or damage that was reported, and it is important to note that the two can be and are often different. Accident Reported– An incident that typically will involve another vehicle and a police report. Damage Reported– This will be from any damage to the vehicle, be it a two car or a single car accident, and even door dings and scratches. Yes, I have heard of small dents being reported. The next section of a Carfax Report that you should pay attention to is the number of owners. To make this simple: If you have a car that’s 3 years old you should have no more than one owner. If you have a car that’s 10 years old, a good number would be 3 owners. These types of estimates should only be used as guidelines, and they should never substitute for common sense. If you are buying a car that’s 3 years old with 2 owners, because the first owner gave back a car to the dealership the same week they bought it, that’s not going to be considered a negative. You also have Lease Swaps that are becoming more and more popular, which can create more owners than we are typically accustomed to seeing. The very nature of Vehicle History reports makes their value vulnerable to a lack of reporting, and there are simply too many mechanics and service departments that do not report vehicle services for you to self determine that a report without a service history means the car wasn’t cared for. I myself change my own oil, which actually allows me to use higher quality materials because that way they become more affordable. Doesn't That Make My Car Better? It should, but sadly because this is not going to be on my Carfax Report, your typical used car buyer (You for example), might actually get a bad feeling about my car, possibly concluding that I never changed my oil? 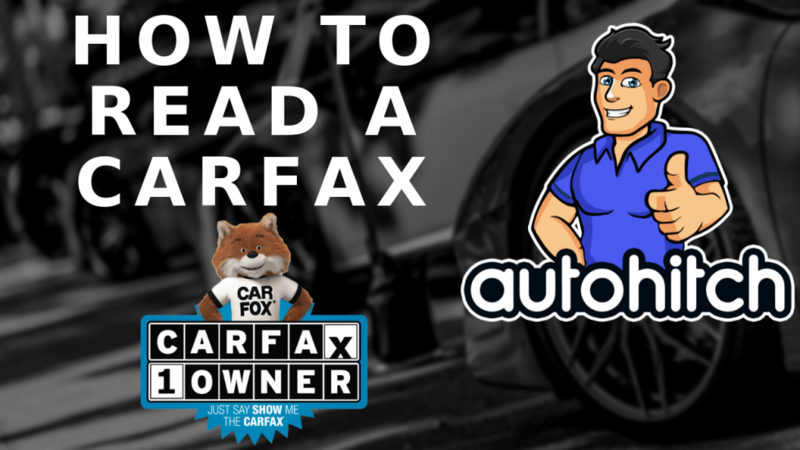 A Carfax Report that has an extensive history of service is a good thing, and you should feel "Slightly" comforted by it, however, if you do not see any or very few service records (Especially on older vehicles) please don't think anything of it. I would venture to say that the section of the Carfax which identifies the type of ownership a car was registered under is the most skimmed over on the report, and like any section, it shouldn’t be, because it’s there for a reason. Before you assume that I am going to tell you anything outside of personal ownership is bad, let me stop you! I actually really like Government or Municipal Vehicles and “Some” commercial vehicles. Cars used by govt agencies have a tendency to be (At the least) very well maintained and (In certain instances) have very low miles. Because of this, don’t ever overlook a vehicle just because it was used by a govt agency. This section of the Carfax Report is going to tell you the last state the vehicle was registered in. The idea behind this information is that if you see a car from a northern state, or a state that is known for a lot of snow and salty roads, you can try to avoid that vehicle or at least be alerted to the fact that it may have potential rust problems. The simple answer is yes. The more complex answer is “Supposedly not as fast”. It’s said that newer cars are built to better withstand the salt of northern roads, but from everything I have seen and heard it’s not so much of a preventive defense as it is something that delays the inevitable. Continue to be weary of cars from up north more so than cars from the south (Florida, Texas, etc) because of potential rust issues. If you are able to get a vehicle inspection and find no rust, then the cars are comparable. Has The Odometer Been Tampered With Or Rolled Back? The bottom section in the Carfax Report Card is going to address the odometer and show you the “Last Reported Odometer Reading”. This particular section of the report is designed to protect used car buyers against anyone who may have rolled back a vehicles odometer so that they could sell a car for more money (Showing low miles). The answer is that in 2019 an odometer can absolutely still be rolled back. Listen: If you can hack Facebook, then someone can figure out how to rollback a cars mileage! That being said, it is less of a problem than it used to be, but it can and does still happen, however, having the last reported mileage shown on a Carfax makes any attempt very difficult to pull off unless you are only shaving off a few thousand miles, and why would they waste their time doing that? Remember- Carfax reports are not the deciding factor, they are a guide. They can tell you a whole lot if you know what to look for, but they can miss just as much. 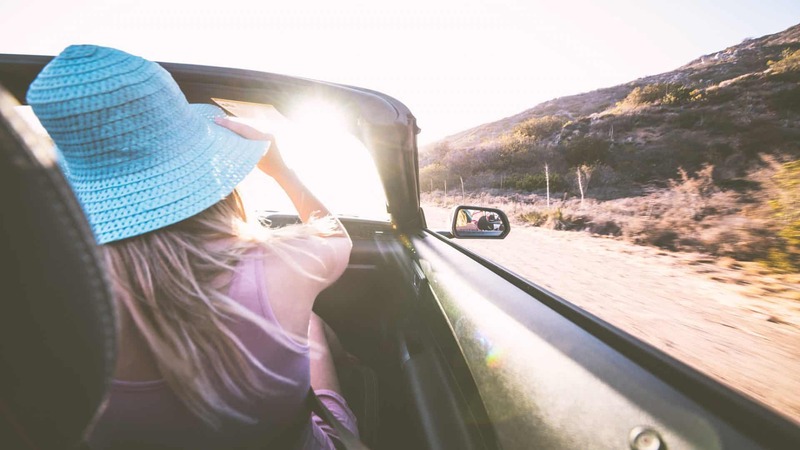 The fact that you should buy a pre-purchase car inspection isn’t negated by a “Clean Carfax”, and if you are trusting the purchase of any used car to a sheet of paper, in today’s world, you should expect some surprises down the road. If you have any questions we have not covered here, please feel free to comment them below! PrevPreviousSalvage And Rebuilt Title Cars | Buyer Beware or Great Deal? When you are looking at your Carfax Report and see, “Accident/Damage Reported Vehicle Functional”, this means that the car was indeed involved in an accident, but that it did not need to be towed away. In this instance, the fact that a vehicle could be driven away signifies damage that wasn’t (Very) serious. 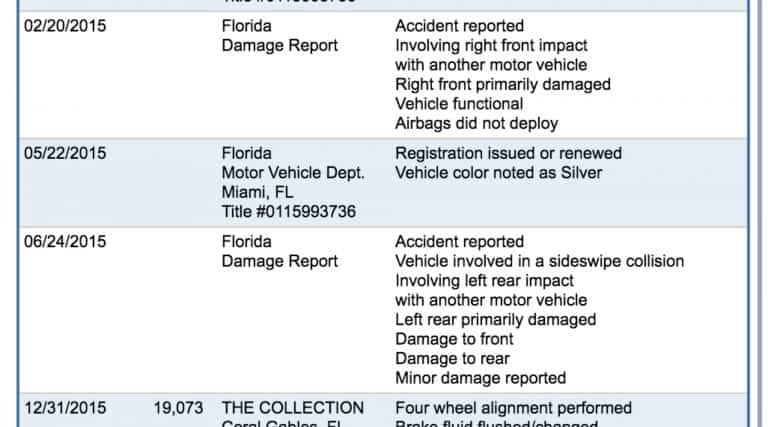 It is actually very common to pull a Carfax Vehicle History and see that damage was reported to a car, that at the very same time, was showing a history with no accidents. The perfect example of an event that could cause this would be when you back out of a parking space and hit something other than another car, maybe a tree or a pole.